The National Science Foundation’s Graduate Research Fellowship Program (GRFP) supports outstanding graduate students who are pursuing research-based master’s and doctoral degrees.The Division of Research, in coordination with the Graduate School and the Office of External Scholarships, Fellowships and Awards, will provide an overview of the program and the application components as well as perspectives from a former NSF director of the GRFP program, faculty and staff who have reviewed for the program, and students who have received the award. The Writing Initiative’s How I Write series presents David Sloan Wilson, SUNY Distinguished Professor of Biology and Anthropology and president, Evolution Institute, on the occasion of the publication of his new book, “This View of Life” (Pantheon). 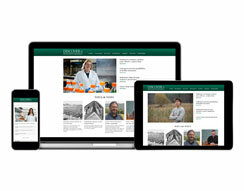 The How I Write series presents Binghamton faculty in conversation with Robert Danberg, PhD, coordinator of campus-wide writing support, about the faculty member’s writing life. “This View of Life: Completing the Darwinian Revolution” is Wilson's third book written for a general audience. He argues that the Darwinian revolution will not be complete until it makes sense of everything associated with the words "human," "culture," and "policy" in addition to the word "biology." A series of 5-minute talks by graduate students and postdocs that follow the Ignite format: 20 slides that advance automatically. Speakers from various departments will tell their story of how they are rethinking research. Celebrate the impact of course-based and co-curricular projects resulting from strong partnerships between faculty, staff, students and the community! Join us in recognizing the valuable collaborative work happening between the University and our community partners. Displays will demonstrate the collective impact of successful community-engaged projects run by students, staff and faculty members. Hear students describe the value of experiential learning beyond the boundaries of the classroom, and celebrate what we can accomplish together! Four students will present on two exhibitions on Wednesday, April 10, 12:30 pm. The event will be in the museum’s lower galleries, FA-179. Each student will speak 5-7 minutes in the galleries. Doug Braun and Thomas Rice will present on their co-curated exhibition, "Revisiting the Past: Neoclassicism in Western Art." They were advised by Andrew Walkling, Dean’s Associate Professor of Early Modern Studies. Kaitlyn Horisk and Davina Bisaria will discuss "From the Earth: the Making and Meaning of Maya Tomb Objects." They worked on this exhibition as part of a class, "Blood and Thrones: Ancient Maya Art and Architecture" (ARTH 386A) taught by Visiting Assistant Professor of Anthropology, David Mixter. Richard Harris, a science writer who has been reporting on NPR’s flagship news programs for more than 30 years, will give a talk inspired by his most recent book, titled "Rigor Mortis: How Sloppy Science Creates Worthless Cures, Crushes Hope, and Wastes Billions." We rely on biomedical research for new treatments and cures. But this critical enterprise is not in the best of health itself, Harris says. Scientists are often unable to repeat experiments that other researchers have carried out. "Rigor Mortis" takes a hard look at these problems and explores solutions. All faculties, staff and students are cordially invited to an open house of the Health Sciences Core Facility (HSCF). Join us for a tour of the major instrumentation and core labs and meet faculty and staff of the facility. As part of the Road Map Renewal University Initiatives for the Health Science Transdisciplinary Areas of Excellence (TAE), HSCF provides centralized, shared instrumentation and technology to the university health science research and education. Join us for an exhibit of entries from Binghamton University's third-annual Art of Science competition. There will be a reception with light refreshments from 4-6 p.m. Thursday, April 11, in the Center of Excellence atrium, outside of Symposium Hall. Winners of this year's contest will be announced at 4:30 p.m. This 2-day SUNY Conversations in the Disciplines event features faculty from Binghamton University and other SUNY campuses. Presentations will examine the moral parameters of human rights research, literary and historical dimensions of human rights, and the role of quantitative and technological methods of research. Topics will include human trafficking, artificial intelligence, mass incarceration, refugees and migration, and the Nazi holocaust, among others. 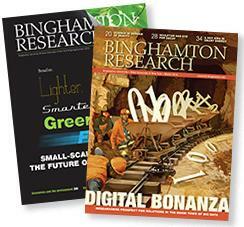 Binghamton Research Days Poster Presentations will take place at 11 a.m. and 2 p.m. Friday, April 12, in the UU-Mandela Room. The event is a chance for undergraduate and graduate students from all academic disciplines to showcase their research. This luncheon panel will feature undergraduate students from freshman to senior year who have done an original research or creative project that has transformed their educational experience and future goals. These students will reflect on what they expected when they got involved in research and what they found, both personally and professionally. Boxed lunches will be provided first come, first serve, for 75 guests. All are welcome. Join us for an exciting talk by prize-winning photographer, artist, writer, and professor Eric Gottesman, who will share his For Freedoms (https://forfreedoms.org) project -- a platform for creative civic engagement, discourse, and direct action.